My cute neighbor (the one who thinks I'm a tad bit crazy for photographing blankets in my backyard) had her overdue baby yesterday. I decided very last minute to make a quilt for them. Because I had only a short amount of time to put it together I came up with this very simple pattern. I pulled out the remainder of my Central Park fabric and made this quilt in just a few days. I really wanted to do the squares on point, but I didn't have enough fabric and wanted to just use what I had. I used up all my leftover charms for the front and had some of the purple cobblestone fabric for the binding. I love the rounded corners. This was my first time trying it, and I think I will always do that for baby quilts. I love how it softens the overall look. I had a few fat quarters that I used for the back which I did set on point. The final size is 44"x46". The sashing is Kona Snow. Not too many pictures this time. It's snowing around here, and I don't think I'll get another good weather day before I give it to her. I hope she likes it. I've decided I love making baby quilts. 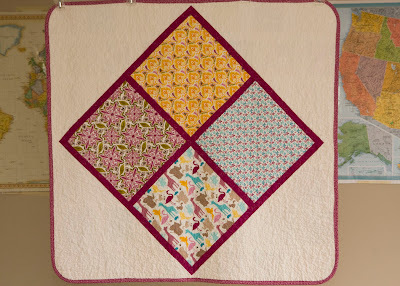 I get to make and design a fun, pretty quilt, but they are nice and small with minimal time commitment. 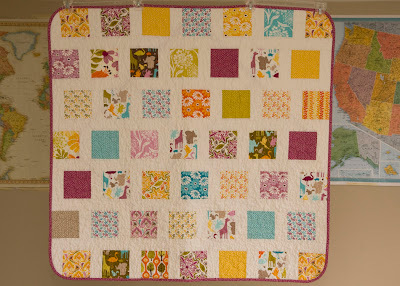 I do have a few more babies coming up (not mine) who need quilts. I have some fun ideas for those. Edit: I got my idea for the rounded corners from this post from That girl...That quilt. She also shows how to cut a bias binding. I do mine a bit different, but it's all the same in the end. It's perfect...I'm sure she will love it! BTW Kona Snow has become one of my favorites! Beautiful quilt! I love the simple design (love the back!) and the rounded corners. Baby blankets are great for quasi-instant gratification...and so much easier to quilt! LOVE the back! And I'll have to give the rounded corned thing a try, too. Baby quilts are SO fun! Oh I love those rounded corners! I'll have to try that next time. 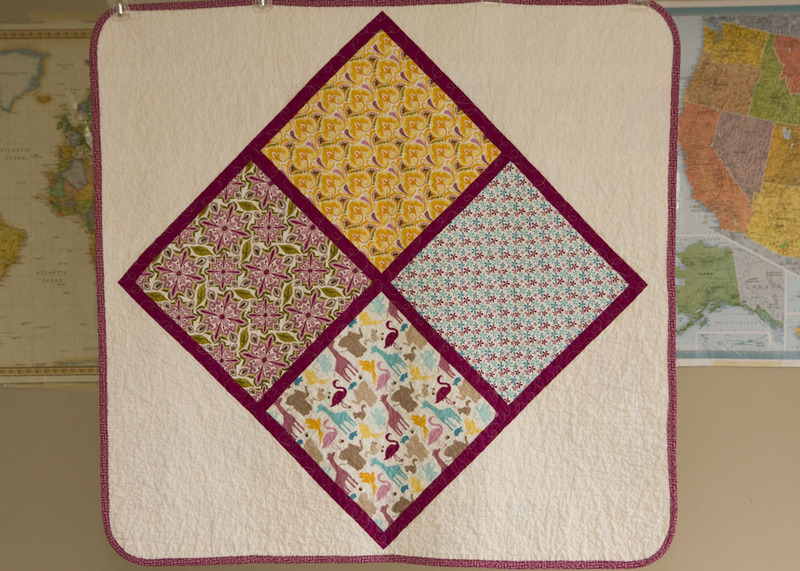 I agree baby quilts are my favorite size to make, love how you arranged the charm squares with the kona, it looks great!! You know what I love. . . you made it so fast and so modest about it. Well I have one thing to say to you. . . "Modest is Hottest!" Such a sweet quilt! I love with you did with the back. It's probably a good thing you can't take pictures! You might spoil the surprise if she saw you in the backyard. P.S. I love the rounded corners! I need to try that. Any tips? Love it. I agree that the rounded corners really soften the look. I always love your stuff, Kati! Thanks for your inspiration. I love simple! I love quick and easy too! Baby quilts are the perfect size, aren't they? Darling quilt - front and back! I really like how you set the back on point. Cute! Love those rounded corners. very very cute! nice work!! I like the quilt, I especially like that back, very nice and very clever! This is such a cute quilt! I'm a big fan of Central Park. I don't think I've ever seen rounded corners before and I agree with you...they look great! 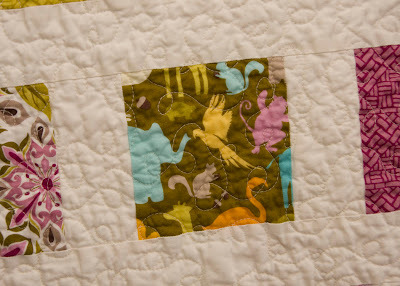 I love the back of this baby quilt, Kati. It is just adorable.